Hacker and cultural critic, passionate about information theory and semantics. Fed up with cyber utopians. It has been well documented that Obama’s fast and steady rise to the steps of the White House was partly due to an uncanny mixture of classical grassroots politics and the embrace of new technology (read social media). The visual appeal of the campaign has been lauded widely and Obama’s early design director, Scott Thomas published a crowdfunded book laying out ideas and images of the “historic campaign”. The Illinois senator even previewed his presidential candidacy in a homemade youtube video where he announces a “different kind of campaign” by which he then meant his website and tools which allows his supporters to gather around, host events and spread the word. Obama’s presedential campaign promised increased transparency. When he took office one of the first actions he took was the signing of a memo, pledging his administration to “an unprecedented level of openness in government”. While this pledge may not have reached its fullest potential on many levels, When Obama took office in 2008, the contrast with his unpopular predessor in terms of the intentions at openness and transparency was still striking. In his memo Obama layed out three ambitious ground principles for his administration. It isn’t just Obama’s refreshing rhetoric abilities that strive for reaching the goals set out in the memo. From the start he surrounded himself with (technical) tools that enhance transparent governance through visual companions. The highpoint of data visualization in the recent Obama years was the online steam of the State of the Union address of 2011. It was enthousiastically announced on the White House as “something you’ve never seen before“, accompanying the regular online live stream were data visualizations concerning key points of the speech, neatly streaming along with the president’s talking points. These visually pleasing and appealing charts are an effective way to spin ultimately complex issues into simple arrays of bars and circles. While this method certainly lends itself for better access to very dense data, the inevitable simplifications are a vessel for politically charged misrepresentations of the facts. 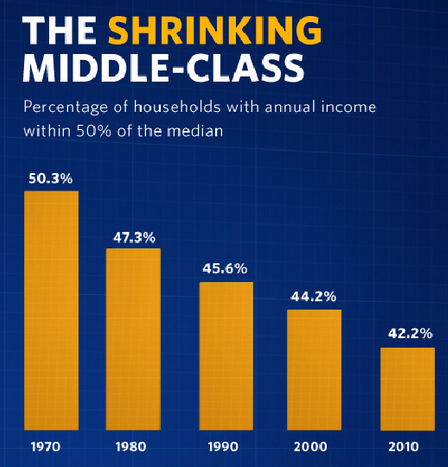 Some graphs are just an illusive spin on the political and economic reality. An info graphic on the nation debt is essentially just focused on a visually effective comparison between the Bush years and the recent years of the Obama administration. In a reaction to recent media attention and political backlash over the surging gas prices, the Whitehouse released an info graphic to put the debate to rest. 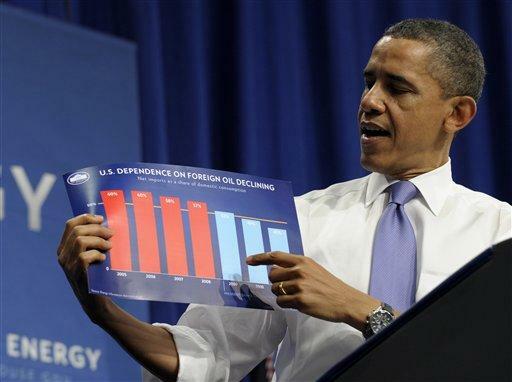 The same visualizations are used in a speech in which Obama holds up a detail of the info graphic on a piece of cardboard. Again the most prominent feature here is the stark contrast between the GOP red (Bush years, depressing low bars) and the democratic blue (Obama years, higher bars!). While the visualizations are a welcome addition in promoting transparency and of the socio-economial state of the nation, the persuasive, political function that they ultimately have turn them into a flat and highly biased simplifications of current affairs. That data visualizations are an integral part of Obama’s persuasion strategy was further underlined when he appointed Edward Tufte in early 2010 to help to help provide transparency on where 787 billion in stimulus tax money was going. One of tasks of the board that Tufte is part of is maintaining recovery.org, a governmental website that provides insight into the billions of tax money injected into the suffering economy of the US, this is better known as the “Recovery Act” or “the Stimulus”. Tufte’s influence is clearly visible as the website relies on various visualizations to offer glimpses into the vast dataset on governmental spendings. The remarkable thing is that Tufte was not hired as a designer, but as a watchdog of values that were put so clearly forward in that early memo. The Obama administration clearly recognized the importance of visual design for transparency when Tufte got the call. Head of the board, Earl Devaney, remarked “It had been a nontransparent ride for me — being in Washington for 37 years”. Tufte was brought in to change that sentiment, “I’m doing this because I like accountability and transparency”, he answered on why he accepted the position. There is also critique, Jerry Brito who maintains stimuluswatch.org “What we want is the raw data. We don’t need another beautiful site”. The intertwining of data visualization and governmental policy is something that is firmly established in the history of data visualization. It was social scientist William Playfair that dramatically improved the graphs that we use today. 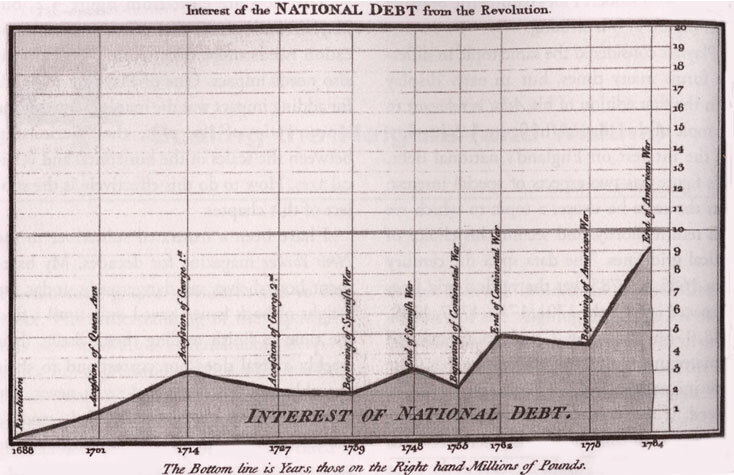 As the inventer of the bar graph, one of his original graphs was on the interest of national debt. It was intended as a critique on England’s policy of financing colonial wars through national debt. By focusing on one part of the data, you might inadvertently obscure another. However, if you’re careful, get to know the data that you’re dealing with, and stay true to what’s there, then it should be easier to overcome bias.